Early June, 1944. It’s the week after the Normandy Landings. The German Army are desperately trying to mobilise as many troops as possible, to reinforce those attempting and failing to quell the invasion. Troops across all of France, especially the portion under the Vichy government, are trying to get there, but meeting heavy opposition from the Resistance. One unit, the 2nd SS Panzer division (known as “Das Reich”) were instrumental in recapturing Tulle, in the Correze, from the Maquisard resistance who had briefly liberated the town. As a reprisal, they hanged 99 townsfolk from lamp posts on the 9th June. 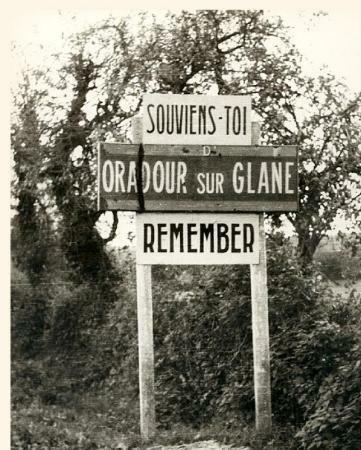 During the early afternoon of the following day, the 10th June, around 200 members of the same division entered the small town of Oradour-sur-Glane, just west of Limoges. They split up, encircled the town, and searched thoroughly. The nearly 650 people they found were forcibly taken to the main town square. There, the men were lined up on one side, before being split into several groups and locked into barns and garages. The women and children were taken to the church. They thought the village was going to be searched for weapons – confident that the disruption would be temporary, and that no weapons would be found. They underestimated Das Reich. Only one woman and five men escaped to watch the town burn that night. In 1946, the French government decided that the remains of the town should be preserved as a memorial. Today, it is in a state of suspended animation. A bare minimum of repairs and upkeep are made to preserve the ruins as close as possible to the way they were left. Oradour has been rebuilt nearby. A “centre of memory” has been built to help visitors understand the background before they enter the “martyr village”. This entry was posted in By Country - France, Personal stuff. Bookmark the permalink.